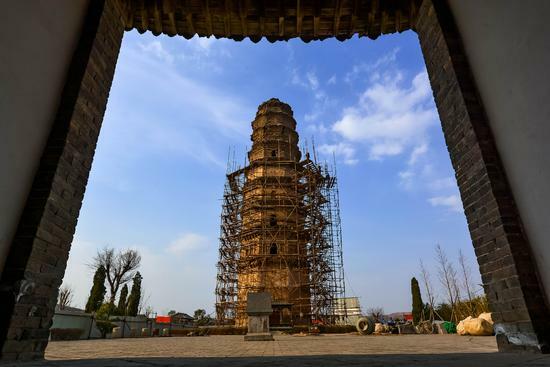 A thousand-year-old pagoda in the Wuhua Temple of Yiyang county, Henan province has started on its largest-scale renovation recently. The renovation is expected to be completed at the end of the year. According to the Yiyang county annals, the pagoda was built in the Song Dynasty (960 - 1279), but some of the construction materials date from the Tang Dynasty (618 - 907). The nine-story octangular pagoda stands 37.2 meters tall and features carvings of buddhas. "Due to the lack of repair, it was leaning, and some of the stones were missing or weathered away," said Huo Xiaofeng, head of the cultural relics management office of Yiyang. "The roof eaves especially were seriously damaged." Over time, the other parts of the temple complex were destroyed, leaving just the Wuhua Temple. The pagoda has also tilted over the centuries, leading locals to jokingly call it "Luoyang's Tower of Pisa".